As the Siren Snow Release Party continues, we're speaking with the author, Victoria Barrow, about this exciting new release! Tricia: Welcome, Victoria. Please tell us a little about yourself. Victoria: Well, I just got engaged (December 8th, 2012! ), and started writing my book the day after. I live in California currently, with my fiance and our two kitties. I work part time while I go to school to become an ASL interpreter, and Siren Snow is my first book. I'm originally from Texas (DFW). I think I miss my momma's sweet tea the most. Victoria: Everyone says this, but I've always been a writer. It really picked up in middle school with horrible fan fiction, but I've learned a lot since then. I took a creative writing class in high school, and absolutely loved it. My teacher encouraged me to keep writing, and I took another course in college that I learned a lot from. Siren Snow is my very first “big” project. Tricia: Can you tell us about Siren Snow? Victoria: Siren Snow is the first in my (also first) book series, entitled 'The Redhaven Saga'. The series follows Lucilla Sinclair, who's the Witch-Warden for Washington state. This first book is, well, her first big 'case', you could say. (A lot of firsts with this Siren Snow). Long story short, it involves a Siren, shadow spawn, and a pretty demon. Victoria: The idea for this book stewed for at least two years, after reading a lot of Jim Butcher and Laurell K. Hamilton. It was a story I wanted to read, but it didn't exist yet, so I wrote it. I am TOTALLY in love with urban fantasy, and the 'modern-magic'-ness of it all. Victoria: Just writing it. I am notoriously easy to distract, and having the internet just a click away did not do me any favors. There's so many other things you need to do when writing a book besides the actual writing, and I found myself doing those things too much. I'm a procrastinator, too. Tricia: Which character was the most difficult for you to write? Which character was the easiest? Victoria: I struggled with Mishal. He's naturally stoic and quiet, and hides a lot of himself, so it was hard for me to find his voice. Lucy was the easiest – she's basically my snarkyness personified. Well, partially, anyway. She writes herself. Tricia: What is your vision for the Redhaven Saga as a whole? Victoria: Well, without giving away too much, the finale is going to be so much fun. We're only getting tiny hints of it in the first book, but the last one should (I hope) tie everything up with a punch. Victoria: If you're thinking about writing a book, do it. Don't wait, don't “flesh it out” anymore, just start writing. It'll write itself. I can't tell you how much I regret not writing my book sooner. Just write. Just. Write. If you've already written your book, good! Keep writing. Don't stop at just the one or two. Write forever. Write like you mean it. 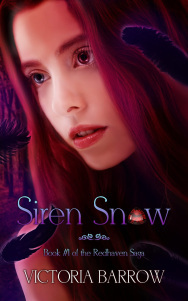 Siren Snow is now available on Kindle. I highly recommend it! You can read the entire first chapter right here on Authors to Watch! Wow, it's awesome the author listened to Two Steps From Hell, one of my favorite groups of trailer music!! Trailer music is definitely great to write to!! They're indeed very awesome. :D!